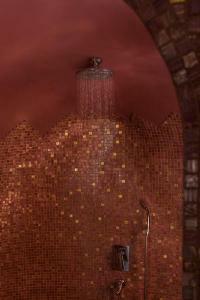 Anteliz Suites is located on the edge of the Fira hillside and has an outdoor pool with hydromassage. The rooms have air conditioning, free plasma TV and free Wi-Fi. The double rooms are located on the level of the pool terrace, have traditional finishes and offer views of the pool or the sea. This apartment with a volcano view includes a seating and dining area. 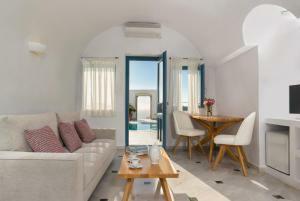 The junior suites have a private balcony with panoramic views of the caldera, the volcano and the Aegean Sea. This suite includes a separate living and dining area. This spacious VIP suite features 2 bathrooms, a kitchenette, a living / dining area, a private terrace with panoramic views of the caldera and the Aegean Sea. 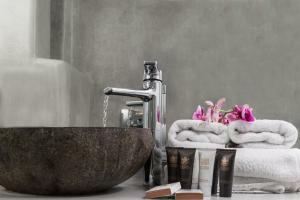 This suite has air conditioning, seating area and private pool. 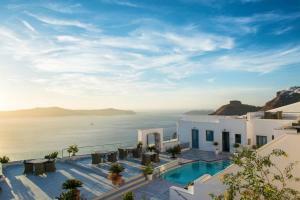 It has a private terrace with panoramic views of the caldera and the Aegean Sea. This suite has a balcony with sea views and a private hot tub. 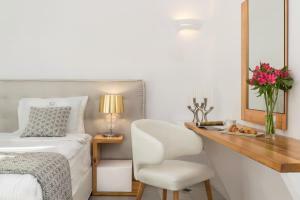 The air-conditioned accommodation offers a separate seating area, a flat-screen satellite TV, a minibar and a hairdryer.